In tomato (Solanum lycopersicum), there are sixteen Mlo genes, with SlMlo1 being the major contributor to the susceptibility to the powdery mildew caused by Oidium neolycopersici. Natural loss-of-function slmlo1 mutants are available in tomato, however, introgression of such mutations is a lengthy process. 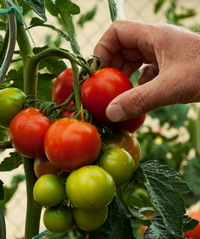 The team of Vladimir Nekrasov from the Sainsbury Laboratory, Norwich Research Park in the UK aimed to generate a transgene-free genetically edited slmlo1 tomato using the CRISPR-Cas9 system. The team targeted the SlMlo1 locus using the double sgRNA strategy. Transformants were analyzed and eight out of ten tested T0 transformants indicated the presence of mutations. Assays using the powdery mildew fungus revealed that all the generated T0 slmlo1 mutant plants were resistant to the pathogen, while wild-type plants were susceptible. Furthermore, the slmlo1 mutant plants were morphologically similar to the wild type and also produced harvested fruit weight similar to the wild types. The team named the generated variety Tomelo. This study presents evidence for CRISPR-Cas9 being a highly precise tool for genome editing in tomato. For more on this study, read the article in Nature.